Survival in the wilderness can depend on knowing several skills. But if you’re fit it will be a great deal easier. At times fitness can be the factor that separates life from death. Any survivalist also has to be committed to physical fitness. Survival requires mental strength and fitness, but the body also needs to be in excellent shape. Even if you’re far from that now, you can still achieve it. Being fit doesn’t simply mean being strong. It also means aerobic strength, which translates practically to endurance, something that can be vital for survival. Building up both aspects is important to gaining real fitness. Before beginning, especially if you’ve been out of shape, check with your GP first. There are several exercise programmes that could have been made precisely for those interested in wilderness survival. Both the Army and the Royal Marine Commandos have them, either as classes or as books. This is what they use to toughen up troops and keep them in shape, and these are men who have to march and fight over rough terrain whilst carrying heavy packs. If it can work for them, it can work for anyone, although most people won’t need some of the more extreme exercises, such as jumping into a pool of freezing water in full gear. If you’ve been learning about wilderness survival, the chances are that you’re taking steps to become fitter. One thing you can’t do is smoke, and if you do, you should stop – there’s no supply of cigarettes in the great outdoors. Don’t expect to become fully fit overnight. It needs to be a gradual programme that encompasses regular exercise and diet. Don’t try to push it too fast or too hard. It’s much better to go slowly and allow your body to gain in strength and endurance. 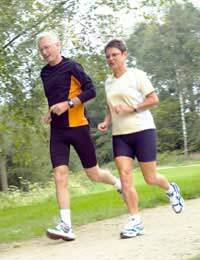 When you’re fit you can walk longer without becoming tired. It’s easier to climb hills and you can simply last longer. These are vital for survival. Being in peak condition will always help you when outdoors. Include plenty of walking in your exercise schedule, especially with a weighted pack. This will help increase your endurance skills. Running can also be useful. When starting to run, begin with short distances (no more than a mile) a few times a week and gradually build up distances. You don’t need to be able to compete in a marathon but you should eventually be able to cover several miles at a time without flagging. Remember to keep yourself very well hydrated when running. After you’ve followed a good exercise regime for a few months you’ll feel the difference in your body, and probably also see it in the redistribution of muscle. Hiking will become easier and stamina will increase, which will be beneficial when out on survival exercises. Even those who began as moderately fit will notice a real change. You do have to keep up the programme in order for it to be effective, of course, but exercise can become addictive, and once firmly embedded in a daily schedule it becomes normal. You’ll find that not only do you feel better, but when it comes to survival it will greatly improve your chances.